After completion of the Swept Away Quest, you may be wondering how Trogs got so... Purple! The fact is, Wendy has been working on an experimental dye that you can put on your very own Cat or Kitten. Begin by speaking to Wendy who can be found north of the Wizard's Tower. In order to start this Miniquest, you must have completed Swept Away. 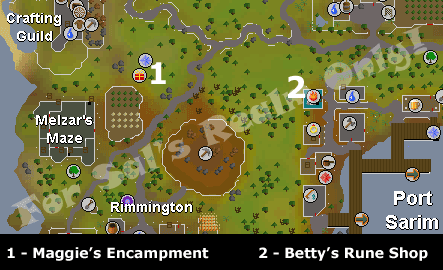 Wendy can be found in Maggie the traveling witch's encampment, north of Rimmington and east of the Crafting Guild. To learn about how to make your Cat turn purple, question her on Purple Cats. She will explain that all she needs is a vial of Magic Unguent from Lottie. 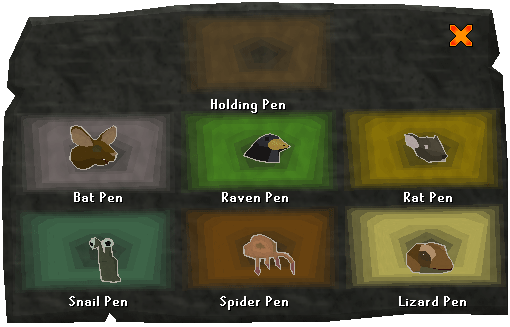 Travel east to Port Sarim and climb down the ladder in Betty's Rune Shop. Speak to Lottie about retrieving the Magic Unguent and she will tell you that you are allowed to take it. However, since you rearranged the creatures in Swept Away so easily, Betty has become paranoid and has mixed them up even more to create a very challenging Creature Puzzle. Talk to Lottie again to receive the Magic Slate so you can get to work. Looking at the Magic Slate, you will see that Lottie was right and the creatures are in even more of a mess! Remember the rules to organizing this mess; you cannot carry more than one creature at a time. And none of the animals can be carried through the door of a chamber that contains another creature in an enclosure. Failure to follow these rules will cause the entire puzzle to be reset. When attempting to turn a Hellcat purple, you will get a message saying that it will turn back into a normal cat. 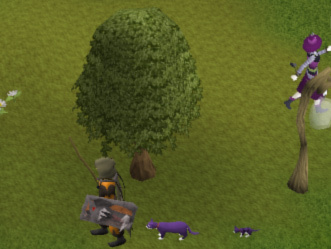 Purple kittens will grow up to be a Purple cat. Once you understand these terms, use your feline on Wendy so she can put some Purple dye on it! Warning: Wendy has not discovered a way to un-colour a cat. Once your cat has been dyed purple, the effect is permanent and cannot be reversed! Congratulations, you are now the proud owner of a very stylish pet!